A professional Wedding Coordinator can prove invaluable, saving you time and money. Update December 29, 2016: I first published this four years ago, but all the advice it contains is as fresh and relevant now, as it was then. And warm congratulations to all you couples who became engaged over the holidays. Once the intoxicating first flush of the proposal has faded somewhat – but not too much I hope – it’s time to focus on the work ahead. For as much as planning a wedding can be an awful lot of fun, it is an awful lot of work. Assuming you’ve shared your happy news with family and friends you can now get down to the details of planning your special day. So, where to begin? Your first and most important responsibility is to set a budget as every aspect of your wedding flows from there. The venue you choose, the date of your wedding (a Saturday in August is going to cost more than a Friday in March), the number of guests you’ll be inviting, all of these important considerations depend on your budget. Flexibility is key to successful wedding planning but your budget should be carved in granite. No couple should start off their married life in debt. Remember, your wedding day is just that: one day. Marriage lasts a lot longer! Should You Hire a Wedding Coordinator? To the above list I would add: Wedding Coordinator. Note: not your friend who has little experience or few qualifications beyond having recently planned her own wedding. A certified, professional Wedding Planner/Coordinator will save you countless hours and potentially thousands of dollars. If this seems counter-intuitive because, yes, we do charge for our expertise, keep in mind that your Wedding Coordinator has already done much of the legwork. With our knowledge of and contacts within the industry we are able to direct you and your fiance to venues and wedding vendors that can help you create the wedding of your dreams – on budget. Almost 20% of Canadian brides admit to increased bickering with their beloved during the planning process. Planning your wedding will be stressful and tensions will run high. Your Wedding Coordinator will be a calm, objective third party, as excited for your big day as you two, but keeping a firm eye on the big picture. She – or he – will help you focus on your priorities while keeping track of the thousands of small details that go into putting it all together. 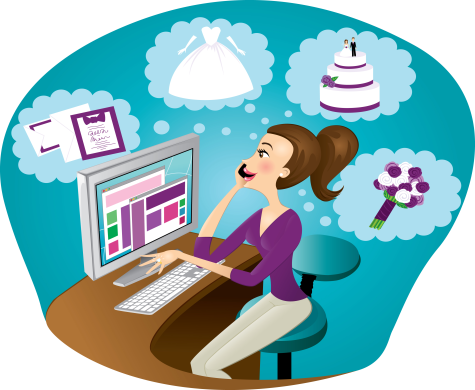 In the long run your Wedding Coordinator will save you time, money – and eliminate those stress headaches. Still not sure if a Wedding Coordinator is right for you? Consider these tips from The Frugal Bride.